We would like to announce and congratulate the winner of the Honors 2018 TShirt Contest. This year Honors students competed to have their Tshirt design be the Honors 50th Anniversary design. 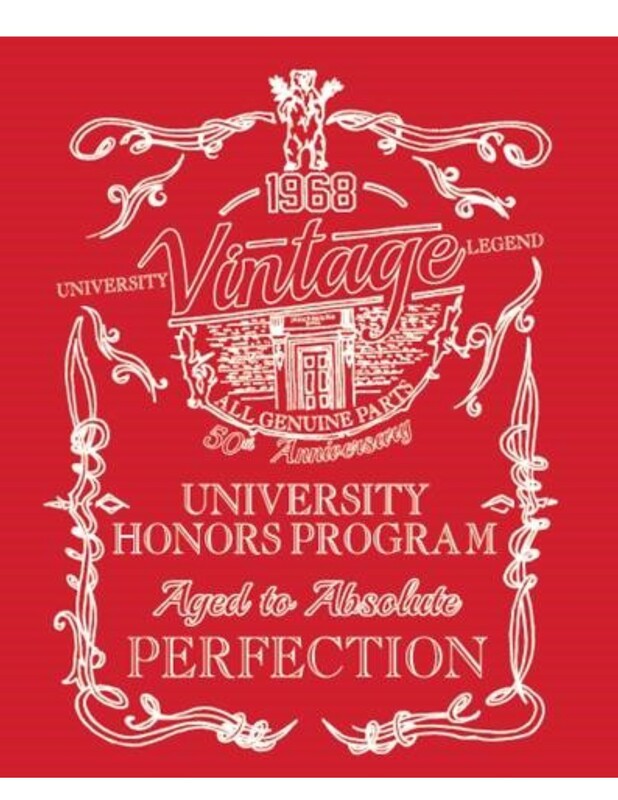 Out of 18 designs, Kailyn Schexnayder's "Vintage Honors" won for best Tshirt. With the UL Lafayette Logo on the sleeve and the larger than life image on the front of the shirt, this year's Honors Tshirt is both stylized and memorable. Kailyn received a $250 check for her efforts, and we congratulate her on her participation and victory. We thank everyone for their participation in the competition, and we look forward to our Honors students receiving shirts. To receive a shirt, attend the 2018 Fall Mixer; dates and time are TBA and will be announced in seminar. If you would like to see the current shirt, the inaugural USL shirt from the 1990s and our 50th Anniversary shirt are hanging in cases in the Noisy Lounge. As always, Per Sapientiam Felicitas.